Get the facts on the slimy green growth that plagues nursery container yards. 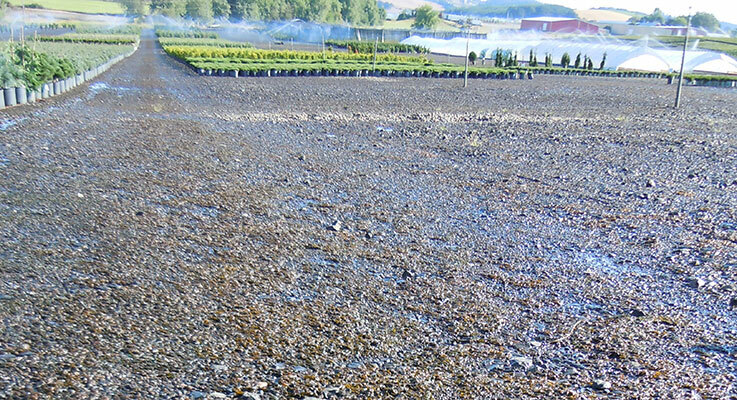 Extensive cyanobacterial mat on gravel lane in a Willamette Valley nursery. On the soil and dark gravel of many Oregon nursery container yards is a sprawling, dark-green, gelatinous growth that covers the ground like a mat. These mats are sometimes called blue-green algae, and often Nostoc. However, calling it algae is misleading, as Nostoc is not an algae, but rather a cyanobacteria. Nostoc is only one of several kinds of cyanobacteria that form this green aggregate, which we refer to here as a cyanobacterial mat. But what exactly is a cyanobacterial mat, and why does it thrive in a nursery environment? The plant pathology lab at the North Willamette Research and Extension Center set about answering this question by first identifying the organisms present in the mat. By understanding the identity and capabilities of the cyanobacteria, we learned a bit more about the role that these organisms play in natural soils, and how that role changes when they grow in a nursery setting. The information provided here can help to inform mitigation techniques to target the biology of the cyanobacteria. Cyanobacteria are oxygenic photosynthetic prokaryotes; in other words, they are bacteria that produce their own food using sunlight and carbon dioxide in the air, and while doing so they provide oxygen to the environment. As a result, they greatly influence the global balance of carbon dioxide and oxygen in the atmosphere. Some species are able to fix nitrogen, converting otherwise inaccessible forms of nitrogen to a form that cyanobacteria and plants can use. The fixation of nitrogen by cyanobacteria is an important function for the health of soil microbe communities. The ability of cyanobacteria to make their own food and nutrients — in addition to their resilient cell walls — allows them to flourish in all parts of the globe, from the extreme conditions of the Antarctic to the local soils of Oregon nursery container yards. Cyanobacterial mats that grow from moist soil in container yards are a burden to many nurseries in the Willamette Valley. The mats can grow up to several inches thick, making them an aesthetic issue and slipping hazard in nurseries, though there is no evidence that they are harmful to nursery products (see Figure 1). Knowing the cellular components of cyanobacteria can help explain why these mats in nurseries are so resilient. Cyanobacteria are single-celled organisms. However, they can also exist in multicellular states called filaments, where cells adhere to each other within a sheath and communicate (Flores and Herrero, 2009). By living in a multicellular state, cells can share nutrients and food within a filament, thus allowing cyanobacteria to distribute over a large area in search of sunlight, nutrients and water. By culturing mat samples from several Oregon nurseries in our laboratory (see Figure 2), we were able to isolate up to eight different types of unicellular and filamentous cyanobacteria. Additionally, we identified structures on some of these filamentous cyanobacteria where nitrogen fixation occurs. A typical cyanobacterium cell is called a vegetative cell, but under certain pressures cyanobacteria can differentiate into heterocysts, hormogonia and akinetes. • Heterocysts are specialized cells where cyanobacteria perform nitrogen fixation. • Hormogonia are motile fragments of filaments that quickly get the bacterium from one place to another. When experiencing extreme heat or drought, they can form specialized cells called akinetes. • Akinetes are dormant, resilient spores that can germinate in suitable conditions to produce a new filament. Once akinetes are formed, growth is stunted but the cells are still living. When good growing conditions return, the bacteria will begin to divide and return to a healthy state. Cyanobacteria are sometimes known as blue-green algae because of their coloring and algal-like appearance. However, cyanobacteria are distinct from algae in many ways, most notably in the structure of the cell wall. The makeup of a cell wall determines how a cell will interact with its environment. Each individual cyanobacterium cell has a cellular membrane that is surrounded by an outer layer of proteins and sugars. Beyond that, many species have another layer of defense — a rigid outer sheath made up of polysaccharides, similar to plant cellulose (Hoiczyk, 1998). Nursery managers who have struggled to control cyanobacterial growth have dealt firsthand with this outer cellular defense. 1. The cellular walls of cyanobacteria are chemically different from algal walls and cannot be expected to respond to pesticides that target the algal cell wall. 2. The entire mat needs to be treated, not a portion of it (in the fashion of systemic treatments), because each cell can function as an independent organism. 3. Chemical control should be implemented when the mats look healthy; unhealthy-looking mats will be harder to treat because they will have already produced akinetes. Cyanobacteria once dominated life on Earth, from about three billion years ago to 500 million years ago. During this time, they created the first atmospheric oxygen, which led to the development of animal and plant life on Earth. Cyanobacteria have long persisted with scarce resources, so they can flourish in places with abundant resources, such as a nursery environment. Cyanobacteria isolated from one nursery’s irrigation system were also found in that nursery’s mat samples, indicating that the mat-forming bacteria were present throughout the entire nursery, exploiting the abundance of water and nutrient availability to proliferate. Cyanobacteria are terrestrial and aquatic organisms. Though they can manage in dry areas for a period of time, a wet environment is necessary for their ultimate survival. The frequent watering of nursery plants on poorly draining soils leads to damp ground and shallow standing water. These are the optimal conditions for cyanobacteria growth. By limiting these moist conditions, the thickness and spread of the mats can be reduced. Perhaps the most effective cultural practice is to limit the area of the can yard that is irrigated by placing pots closer together to reduce excess water on the ground. This is most effective in the summer, when rainfall is minimal. Removing the desiccated mats during this time can greatly slow the return of healthy mats when rain arrives. Additionally, reducing phosphorus fertilizer runoff can curtail mat growth, because phosphorus is the most limiting nutrient for cyanobacterial development. Thanks to previous pesticide effectiveness research, we have techniques for chemical control of these mats (Parke and Stoven, 2014). Herbicides that solely target plant-specific processes are ineffective, and in the case of glyphosate, could even benefit the cyanobacteria as a source of phosphorus. Currently, the most effective herbicide that we know of is pelargonic acid (Scythe, Dow AgroSciences). Pelargonic acid is a commonly occurring fatty acid in plant cells, but when used as a pesticide, it destroys the plant’s waxy cuticle, or the sheath of the cyanobacteria in this case. This finding corroborates other research that shows compounds released from decomposing plant material can effectively suppress cyanobacterial growth (Haggard et al., 2013). In a natural system there are many biological controls that keep the mats from taking over more land than they already do. Current nursery practices may contribute to the proliferation of the cyanobacteria by reducing the populations of natural enemies. Shore fly pupae (Ephydridae family) and larvae of the crane fly, Limonia distans (Tipulidae family), were found in some samples taken from Willamette Valley nurseries. The adults and larvae feed on algae, mosses and other microorganisms in semiaquatic habitats (Foote, 1995). They are similar in size to fungal gnats. They are also affected by the same pesticides used on fungal gnats. Shore flies are thought to carry fungal spores, so they are not a biocontrol solution for nurseries, but rather part of the natural ecosystem that usually keeps these growths in check. The gelatinous green mat found in nurseries is an aggregate of different cyanobacteria. It is the food source for at least two different larvae. Our finding of a nitrogen-fixing species in the mats prompted more research into their potential use as a chemical fertilizer alternative — a promising yet challenging scientific inquiry that is in the early stages of research. Overall, the mats have proven to be much more sophisticated and complex than first impressions might suggest. Chemical treatment, though effective, is less productive than cultural management, as natural populations of mat-forming cyanobacteria are commonly present in most any soil. By knowing more about the members of the mats, management practices can be used most effectively to target the few vulnerabilities that these persistent cyanobacteria have. Flores, E., & Herrero, A. (2009). Compartmentalized function through cell differentiation in filamentous cyanobacteria. Nature Reviews Microbiology, 8(1):39–50. Haggard, K.G., Geiger, N.S., Hayes, P.M., & Milligan, A.J. (2013). Suppression of cyanobacterial growth of Aphanizomenon flos-aquae by vascular plant decomposition products in Upper Klamath Lake, Oregon. Lake and Reservoir Management, 29:13–22. Hoiczyk, E. (1998). Structural and biochemical analysis of the sheath of Phormidium uncinatum. Journal of Bacteriology, 180(15):3923–3932. Parke, J., & Stoven, H. (2014). Management of the Cyanobacterium Nostoc in Horticultural Nurseries. Pacific Northwest Plant Disease Management Handbook. Foote, B.A. (1995). Biology of Shore Flies. Annual Review of Entomology, 40:417–442.